I’ve been spending the last week or so in desperate preparation for the Hoggetowne Medieval Faire, which starts this weekend and ends next weekend. 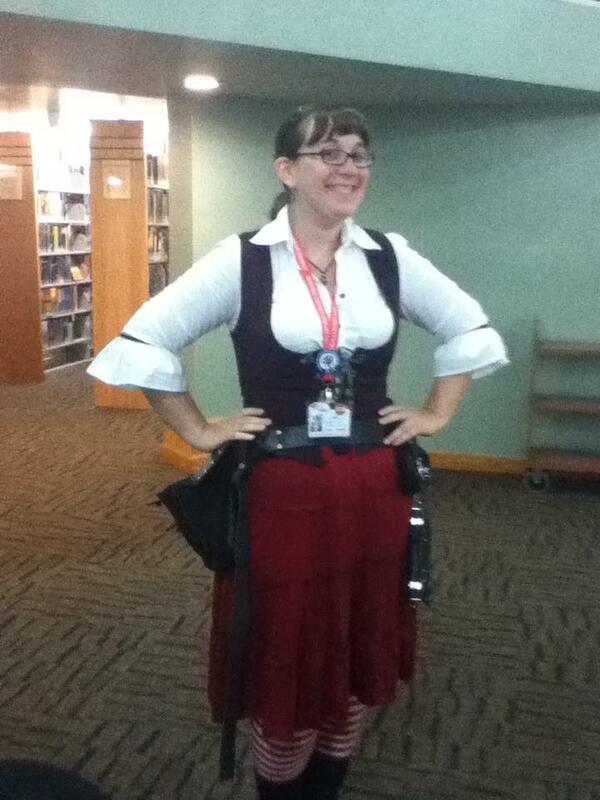 I wore a “dress-code-friendly” version of my wench outfit to the library today! The Faire’s been kind of consuming my whole life outside of work and school and it’s been a little overwhelming! On Saturday we had a wench rehearsal, and had a lot of fun. We love to laugh, and we think we’re hilarious! Then I had a meeting with a producer friend about maybe recording some songs for an EP? Which would be crazy awesome. I think we’re going to see how Faire goes before we think about spending money on professionally recording ourselves. On Sunday the Theives’ Guilde (the troupe that does the Living Chessboard each year) had their dress rehearsal for the City, and it went swimmingly. I also got to sing my song for the other producer of the show, and the actors and I worked out some cues. You can see and hear me sing a song about how great Hoggetowne is at the opening gate scene at 9:45am, just before the gates open and let the masses in. If you’re not inclined to wake up that early, I will be performing as Cherri Tart with the rest of my wenches in Just Desserts at 12:30, 2:00, and 3:30. Come high-five the Bookaneer! I want to share this story with you because I think it’s a perfect example of why I love my job so much. (Also because everyone likes Moments of Cute.) I had just stepped out of our work area and into the Children’s Department floor, about to head upstairs to the desk. As I walked toward the stairs, a little girl of about nine or ten approached me and said, “Excuse me, ma’am?” I asked her what I could do for her and she said she was looking for the Inkheart books. “Do you know who writes them?” I asked. She shook her head and I said “I THINK it’s Funke. Let’s go check.” I walked her over to the fiction section, explaining that they’re in alphabetical order by author (librarianing, as it is apparently called, though I just think of it as an aspect of bookaneering), and when we got to F…Fu…Fun… “There they are!” she exclaimed happily, and picked up the first book from the bottom shelf. “Thank you!” She looked at me like I was a miracle worker. “I’m glad I was right!” I grinned, and then we high-fived and it was awesome. I LOVE it when kids have so much enthusiasm for reading. I hope she hangs on to it. 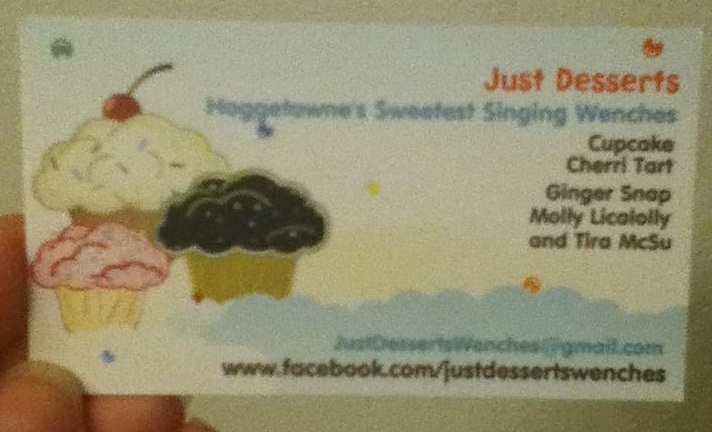 Tonight I’m going to Cupcake‘s to try on my new bloomers, and then tomorrow is the Faire! Huzzah! There’s been a bit of upheaval in my life recently, with the promotion and everything, so I’m going to put together a kind of disjointed post here. I still haven’t learned how to segue. The first thing I want to talk about is the new job! My supervisor and I have been talking about what direction I want to go in here at the library, and I mentioned that I really like the cross-departmental aspects, such as working with eBranch on ereader stuff, attending presentations for new ebook platforms with Tech Services, or helping Circulation on the weekends (incidentally, I recently had my last official weekend in Circulation, barring any last minute emergencies, so that part of my library career is officially over. Mixed feelings about it!) She’s been really responsive and has invited me to a couple of database and collections meetings, and I’ve recently been assigned a massive project involving our print and digital magazines. We’re going to try to find out which of our print magazines actually get read (we have about 240 subscriptions) and if there are any that we should get digital copies of, as well (we’ve only got about 90 Zinio titles). The Zinio catalog hasn’t officially launched yet, though you can find it if you know where to look on our website (Hint: it involves /zinio). So what I’ve done this week is started an Excel database of all the print and digital titles, labeled them with general categories like Fashion or Racing or Dogs, as well as how often each title is published. The Zinio catalog is complete, and since there is a lot of overlap a good chunk of the print titles are done too. The second phase of this database is to work with the Circulation pages, asking them to monitor what they pick up and put away weekly, and then forward the numbers to me to work through. In March, we make a lot of our magazine renewals, so by then I should have some good data to help make decisions. It’s not a perfect system, since patrons may actually put the magazine back when they’re done with them, but it should help in the long run. Another aspect of the new position is displays. Since my first name is also first alphabetically in the department (B is for Bookaneer) I was picked to go first for our new display shelves next to the new quiet reading room. 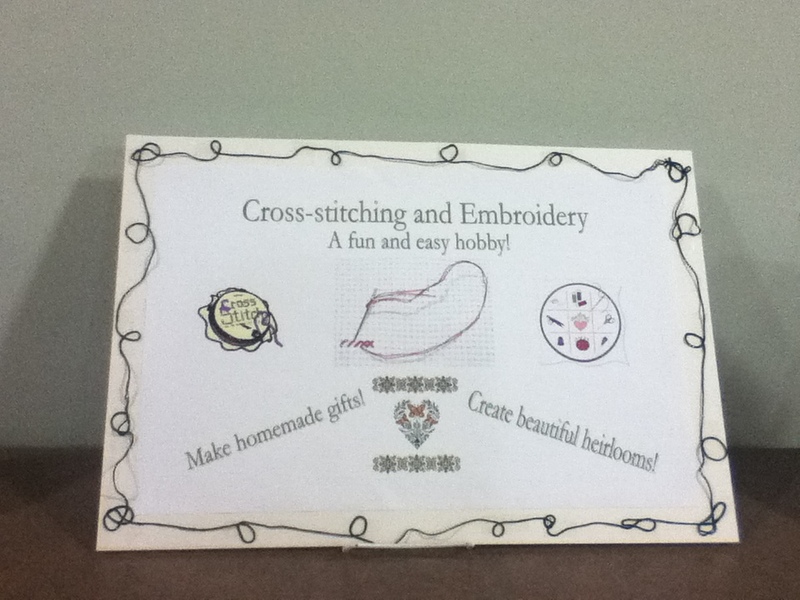 The only criteria was they have to be non-fiction books, so I decided to make a display of cross-stitching and embroidery books, something that is a hobby of mine. The display turned out great, and I think people have really been interacting with it since I’ve had to fill in a couple holes already! My lovingly hand-crafted display sign! 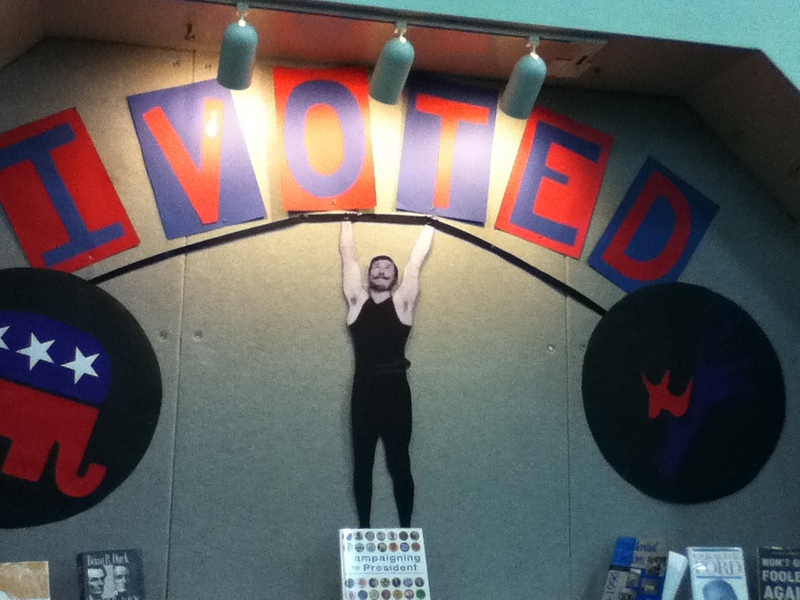 The strongman wants you to vote! Look at this post-election display! So we’re already planning for December, which will be fantasy-related, to coincide with the release of The Hobbit next month. It’s going to be awesome! One of my favorite things about my new position is getting to answer people’s questions. One great story I have from this past week is about an older gentlemen who came up to the reference desk asking about a mystery writer named McDonald, he said the author wrote about a detective who lived on a houseboat. With a little search engine magic, I found the author he was looking for, and told him that we had several different titles by him at our branch. I showed him where they were, and he looked at me like I was some kind of miracle worker and thanked me profusely. It was so gratifying and perfectly summed up the reason I do what I do. I’m sure most of you know about NaNoWriMo: National Novel-Writing Month. If you’re unaware, the month of November has become a time to challenge one’s writing skills, and write a whole novel of 50,000 words in just one month. I’m not participating this year (since I never remember about it until the 5th or 6th) but the library is hosting a write-in every Tuesday night for people to come and work on and talk about their novels. I’m always impressed by those who do it, and I hope to be able to read some sweet finished products! Tomorrow is a big day for the Bookaneer, because I am running in my very first 5K with some great friends, including my pal the Brash Librarian! We’re participating in the Run For Your Lives. I’m kinda nervous, but I think I’m mostly ready. If you had asked me this summer if I would be running a 5K this fall, I would have laughed in your face. But I’m doing it tomorrow, and it’s gonna be great! I also want to mention that The Bookaneer is on Facebook, as well as Tumblr! I’ll be posting and sharing some shorter bits and anecdotes over there, so make sure you follow me! We’ll have a great time! So it’s time for me to get to bed, big day tomorrow. Keep bookaneering, crew! Lots of big news happening in and around the library the last couple weeks! First of all, the biggest news: I was chosen for the promotion to Library Specialist in our Adult Services department! I started last week with training, and am now a member of the library’s reference staff. This is my second promotion since I started working for the library district last December, and I’m very excited about it. It’s a new department with new responsibilities, and I’ve already been selected to attend some product presentations on behalf of my supervisor to decide if we want to purchase new software for the library (one of those was last week, on my third day!). I’m really looking forward to learning new things and helping other people learn things too. In this department I get to put on programs of my own choosing every six weeks or so, and my first one will be on Valentine’s Day! 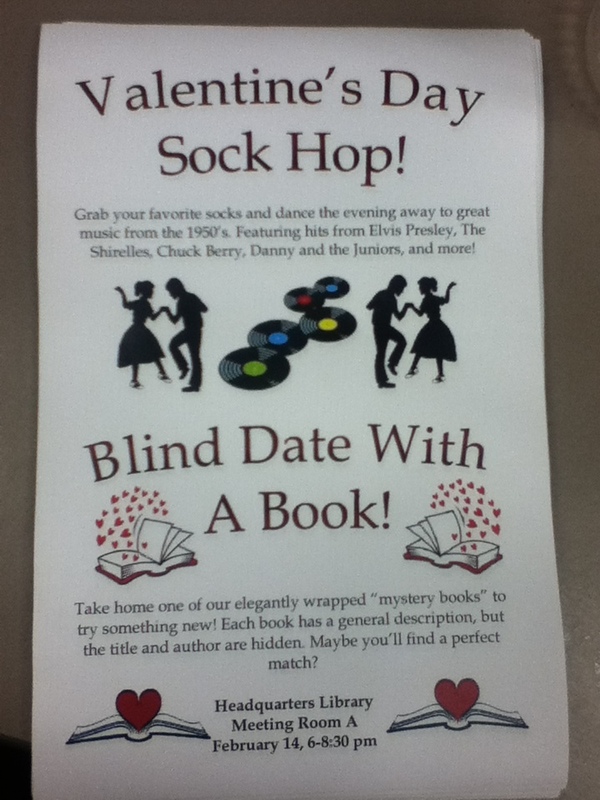 I’m planning on having a cool retro Sock Hop, and I really hope it’s successful! Do you all have any ideas about programs you’d like to see at the library? I would love some suggestions! Speaking of successful, our party to kick of National Friends of the Libraries Week went swimmingly! After a month of meetings and planning and creating posters and setting up displays, the big day finally arrived on Sunday, and everyone loved it. We committee members came in at noon to set up and place the decorations, and festivities started at three. The program was very cool and featured a great slideshow presentation, the food was delicious, the music was perfect (I was placed in charge of music because I had an old CD made by a friend when we graduated from high school, full of songs about friendship) and all of our guests seemed to have a really wonderful time. My friend the Brash Librarian was there, too, as well as members of the Board of Trustees, the Board of Governors, some of our local political representatives, and many of our Friends. The best part was when one of the Board of Trustees mentioned my centerpiece tags in her speech! It was so flattering, and I was a little embarrassed. My fellow committee member GM and I had designed the centerpieces around all the things our Friends have done for us, so each table was unique. They featured pictures of our bookmobile, author galas, book donation bundles, music CDs, children’s books, and more. On each centerpiece we hung a tag that gave a little more information about what each centerpiece represented. We worked really hard on them and all the guests seemed to have fun going to each table and learning about how much the Friends do for us! Some of our Friends were surprised to learn about all the different ways they’ve helped us over the years! Bold Moves October has been going well, I think; I’ve been making positive changes that I would have been otherwise too scared to do. I’ve been thinking about making video book reviews, but I’ve been too nervous to start them. I think with this last week of Bold Moves October I will finally get on the ball and start vlogging! 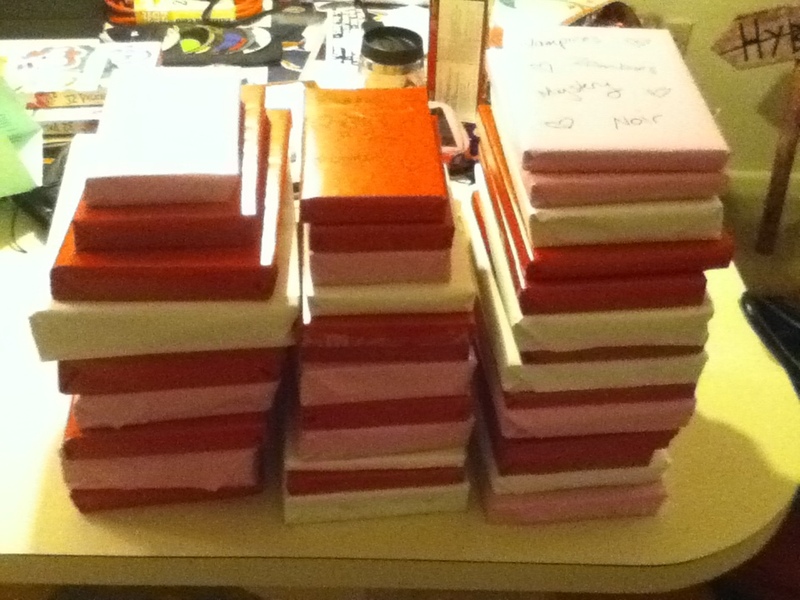 I might do a reading for All Hallow’s Read, too, but I have to pick a story first! What do you think? Should the Bookaneer become a Vlogganeer?